Looking for colonial history books? Biblio.co.uk hosts hundreds of of the finest online book stores and booksellers, including specialists in colonial history. Use the list below to locate a specific specialist bookseller or book store near you. Or, use the form below to search the inventory of all booksellers who specialize in colonial history. Welcome to Bibliosophia - a New Zealand-based internet business, dealing in uncommon and interesting books.Bibliosophia means, literally, "book wisdom". In a work on book collecting, published in 1810, James Beresford defined bibliosophia as "an appetite for collecting books - carefully distinguished from, wholly unconnected with, nay absolutely repugnant to, all idea of reading them". I hope you find something amongst my listings to sate your appetite for collecting - or even reading! 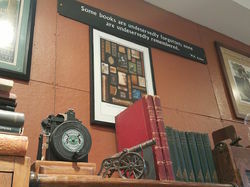 MW Books is an academic and antiquarian bookshop with a large stock in core areas such as Early Travel & Exploration, Nineteenth Century Literature, Early Political Economy, Labour and Social History, and Asian and Colonial History. Please don't hesitate to contact us with your questions or comments regarding any item listed.